The first luxurious home on sale boasts the Whitmore floor plan. Priced at $336,219, it features five bedrooms, four baths, an unfinished basement and a three-car garage. Interior appointments include a main level guest suite with full bath, gourmet kitchen, family room with fireplace and a master suite with dual sinks and an oversized walk-in closet. The second home, priced at $337,320, features the Glenwood floor plan with five bedrooms, four baths, a fully finished daylight basement and a three-car garage. Options include granite countertops, hardwood floors, oak tread stairs and a wet bar in the basement. The third home, also a Glenwood, is priced at $299,900. The home has five bedrooms, four baths, and unfinished daylight basement and a three-car garage. The home includes a formal dining room, gourmet kitchen with island, breakfast room and spacious family room. 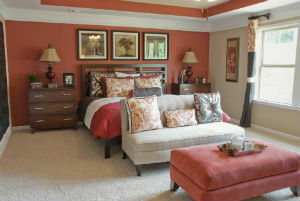 The master suite boasts a luxurious bath with garden tub, walk-in closet, dual sinks and an oversized closet. The community is minutes from the Mall of Georgia, The Avenues Forsyth, North Georgia Premium Outlets, Suwanee Creek Greenway and Lake Lanier. Students residing in the community attend top rated schools, including Riverside Elementary, North Gwinnett Middle and North Gwinnett High. Call Margaret, the on-site agent, at 770-945-6168. *For contract written after 11/12/12 and closed by 12/28/12. Incentive when using preferred lender, Wells Fargo Home Mortgage. All information is believed to be accurate but not warranted. Prices and incentives subject to change without notice. Closing costs paid up to $9,000.